"Christine and family, So very sorry .... you are in my..."
"Our thought and prayers are with you. It was always a..."
"Always in our prayer Forever in our hearts Our sympathy and..."
"Ernie was one of my teaching colleagues at Gorham High..."
GORHAM - Ernest Lawry Manderson, 80, died peacefully on August 19, 2017, at Maine Medical Center. He was born to Ernest V. and Jacquelyn K. (Graves) Manderson on July 28, 1937, in Portland, where he grew up with his two sisters. He attended Portland grade schools and graduated from Cheverus High School in 1955. Following high school, he enlisted and served in the U.S. Marine Corps as a Field Radio Operator for three years. 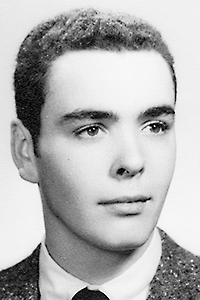 He graduated from the University of Maine in Orono in 1962 with a bachelor's degree, and in 1964 with a master's degree in English and was elected to Phi Beta Kappa. Ernest taught English for four years at Hanover High School in New Hampshire and then for four years at Gorham High School in Maine. He left teaching to attend the University of Maine School of Law and graduated in 1976. He practiced law in Westbrook and Gorham until he retired in 2015 at the age of 78. Ernest married Helen Nielsen in June 1963. They had two children, Christine and Thomas. Ernest enjoyed hiking with his children, gardening and planting trees, carpentry, woodworking, bird watching, and reading, especially non-fiction. He loved spending time with his children and grandchildren and attended many school concerts and sports events. He also loved to see his extended family, and with his wife, hosted a large party for family and friends every Christmas for many years. Ernest also enjoyed to travel and took trips to Alaska, Ireland, and the Southwest. He particularly enjoyed his annual summer trips to Canada. Ernest was a lifelong Democrat and community service was an important part of his life. He was a founding member of the Gorham Food Pantry and a board member at the Baxter Memorial Library, Gorham Senior Housing, and the Westbrook Community Hospital. Ernest was a caring, generous man who always had a positive outlook and kind words. Ernest is survived by his wife of 54 years, Helen; their two children, Christine and her husband Brian Peters of Yarmouth, and Thomas of Gorham. He is also survived by his four grandchildren, Hannah and Ethan Peters and Neil and Andrew Manderson; his two sisters, Bernice (Bunny) and her husband Charlie Stevens, and Jean Keefe, his sister-in-law Martha and her husband Louis Maguire; and many nieces and nephews. A private burial service will be held at Calvary Cemetery. A Celebration of Life will be held at Spire 29, 29 School Street, Gorham on Sunday, Sept. 10, from 2-4 p.m.
Condolences may be expressed to the family at www.FuneralAlternatives.net. Arrangements are under the care of Funeral Alternatives, 253 Main Street, Yarmouth.